With Ezekiel Elliot eligible to play week 1 and possibly the entire season, the Dallas Cowboys should be the favorites to win the NFC East. However, they have an extremely difficult schedule and could at any point during the season, see Elliott's suspensions be reinstated. The New York Giants are just hoping for a healthy Odell Becham Jr. if they want to compete in this very tough division. Kirk Cousins is looking to prove to the rest of the NFL that he is a franchise QB and worth a long term contract, but will have to do so with some young, unproven WR talent and a oft-injured TE in Jordan Reed. The Philadelphia Eagles did everything in their power to surround Carson Wentz with talented veterans, now let's see if the kid is for real. After winning five straight against the Giants, Dallas has lost three straight game against New York. 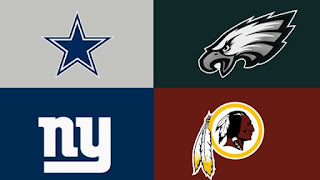 They have split their last 6 contests with the Eagles and won four of 6 against the Redskins. New York is 4-2 over the last three seasons against Washington but struggles against Philadelphia, with just a single win. The Redskins have won 5 straight against the Eagles. The Cowboys play the Broncos, Cardinals, Falcons and Raiders on the road this season. New York also travels to Denver, Oakland & Arizona but gets Tampa Bay rather than Atlanta. The Redskins play both teams in Los Angeles this year, Kansas City, Seattle and New Orleans! Philadelphia has it just as bad with two trips to California to play the Rams & Chargers, a flight to the Northwest to play the Seahawks, and also have to play Chiefs and Panthers on the road. Dallss will host Green Bay, KC and the Seahawks. New York will play Detroit, Seattle, Kansas City and the two teams from Hollywood at home before they host a division rival. The Redskins will face the Raiders, Vikings, Broncos and Cardinals in the nation's capital. Philly's home schedule features Cardinals, Broncos and Raiders.